A man who is alleged to be a kidnapper and was arrested by the police – has claimed innocence of the crime he’s being accused of. Last week, the man identified as Mr. Harris Terungwa Magudu, was arrested and paraded alongside some suspects at the Benue State Police Headquarters in Makurdi. 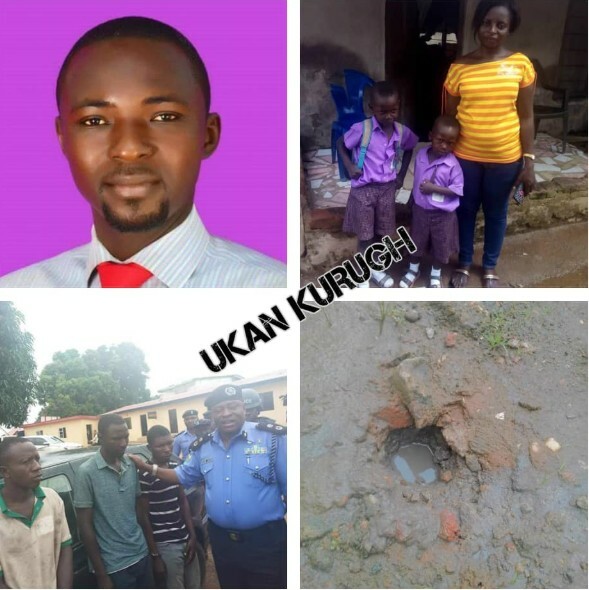 Report has it that Mr. Harris (a father of two children) is a graduate of Industrial Physics from the Federal University of Agriculture, Makurdi and a carpenter alongside two of his friends who were arrested with him on grounds of kidnapping. 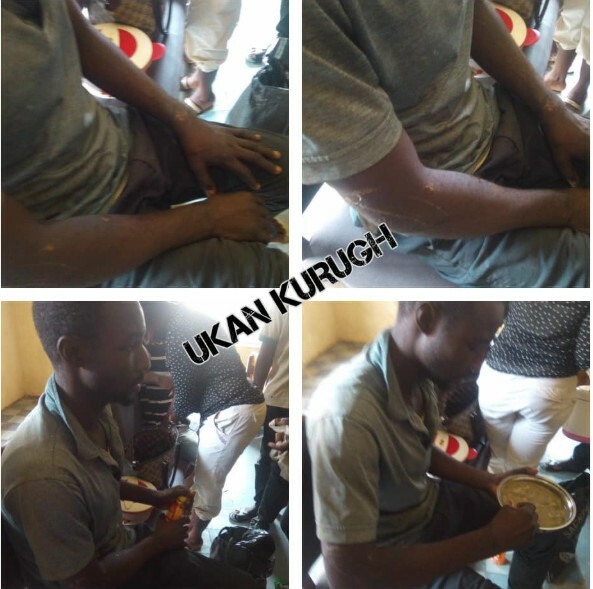 Read the report shared by Ukan Kurugh, a philanthropist who visited him in prison as he seeks for justice over the ‘unlawful arrest’. On Sunday, October 7, 2018, I was accompanied by two friends to the Makurdi Maximum Prison where we met with Mr. Harris to hear his story. He has been tortured beyond human recognition and he limped in pain to get to where we sat. The whole of his body is covered with scars and deep wounds that have been left untreated. He explained that, on or about 19th day of September at about the hour of 8pm, he left his home on Benue State Civil Service Commision Street to get airtime and on his way back, a car was parked and he saw some persons around it. Since it was dark he didn’t get to notice who they were until he got too close when they had already pointed a gun at him, slapped him and asked him to lie down. When he lay down, he discovered a woman was also lying down alongside her daughter. They searched him and finding just his phone on him, they took it. They also took the woman in the car and drove off. Later same night, the woman returned and explained how they took her around Makurdi town in the car and ended up dropping her at Naka Road where she boarded a bike back home. That night, they were later to hear that, another woman had been kidnapped. This whole incidence happened and events overtook it. About two weeks after the incident, men from the headquarters of the Department of State Services (DSS) Called at his house and inquired to know a few things about him and whether he was missing a phone. He explained the above incident to them and how his phone was lost in the process. They advised him to go and make a formal report to the police about his missing phone and then proceed to block the line. This he did the following morning. He reported at B Division and proceeded to block the line. About a week after the call of the DSS officers, his younger brother whom he (Harris) had made his next of kin while registering the line that was lost called Harris from the village that his (younger brother) attention was needed by the State Head of Service for an employment letter. Harris’s younger brother had been a casual staff of the Benue State Government. So the call made it seem like, they were to be interviewed and made permanent staff. He then urged Harris to call the number and get the letter for him. Harris in a bid to get the letter for his younger brother walked into the waiting arms of the police, the Intelligence Response Team (IRT) of the IG of Police. There was no letter from the Head of Service after all. It was a bait to get to Harris. Upon discovery that he was the one they wisked him away. The family was lost as to his whereabouts for days before he showed up in handcuffs in company of police officers severely beaten up. They ransacked his house but found nothing as the wife and kids cried. They again took him away. As he explained this to me and my friends, Harris cried. He said he underwent the torture of his life, that he should admit to being a kidnapper and offering up the arms that they use and mentioning names of his accomplice. Since he couldn’t say admit to what he didn’t know, they tortured life out of him. They made him wear handcuffs and forced him to squat, forcing his hands to his ankles, fixing a stick across his laps from behind, tying and suspending him on an iron bar up and severely beating him. Harris said he contemplated suicide but there was no way. The forced handcuffs have created deep cuts on his wrists. He has a broken leg and scars all over his body. His community had come together when they discovered of his arrest and spend a whole day at D Division where he was initially kept attesting to his innocence and insisting that, he should be released. They police refused and later got them arrested and detained for hours as he was later made to understand. On a second time again, the police showed up in his house with him and acussed the wife of hiding guns for Harris, asking her to bring them. The wife who was in tears brought forth their two kids as the guns she was in custody of. The police shot into the ground in the presence of the kids and removed the empty bullets. They took the family flat screen TV, collected the wife’s phone and again left. They continued their torture on him everyday while also denying his family access to him. They moved him around the police station in Makurdi to spend the nights. He said he has slept at the C Division, E Division, D Division and the Police Headquarters. The torture became unbearable and there was no way to carryout the suicide he contemplated and the police told him, the only alternative was to admit to the crime. Absent choice, he admitted to what he has never done in his life and what he would never do. His friends with whom they did capentry where also picked and paraded as suspects alongside him. At this point while Harris analyzed, he could not hold back his tears and so we too, we all cried. Harris was also made to confess before the Commisioner of Police on Camera else there were threats that he would be tortured to death. His body is testimony to the torture he underwent. Since then, there has been no medical attention and he has a dislocated leg occasioned by the torture that has been left unattended to. When his friends got a lawyer to engage the police, the police promised to charge him to court but never did. It was until a motion of production otherwise called habeas corpus was served on the police that, they hurriedly charged him to court and got him remanded at the Makurdi Maximum Prisons in kanshio where he is.